← How the ferry’s truncated hours effect Algiers’ culture and business (1A story, Times-Picayune. Aug 2014). Tour of brand new New Orleans East Hospital (LA Weekly. Sept. 2014). When it’s said that a place smells “like a hospital,” it’s usually not a compliment. But the nine-week-old New Orleans East Hospital smells brand new. Sunlight pours into every room from an abundance of windows, highlighting the spotlessness of beds and waiting-room chairs where few patients have sat. After four years of planning, negotiations and community outcry, the once languished former Methodist hospital is now back in service with beds, new staff and even a new name. 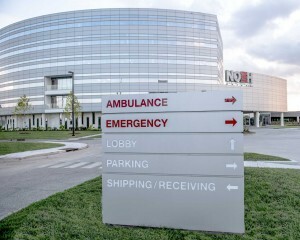 The New Orleans East Hospital is now fully staffed and set to service 160,000 nearby lives: 125,000 or so from New Orleans East and the Lower 9, and over 35,000 in St. Bernard Parish. According to data provided in a pre-construction feasibility study, the population of NOEH’s primary and secondary service areas declined by approximately 50 percent due to Hurricane Katrina. The hospital reopened on July 12 and received its final accreditation on August 18. In the time it’s been open, the hospital has already treated more than 2,500 within the Emergency Depart­ment, and admitted over 140 patients for a higher level of care beyond what they can provide in the emergency capacity. During a recent tour of the new facility, CEO Mario Garner told The Louisiana Weekly about the drive to give the new hospital “local flavor,” from the 120 pieces of local art and photography that line the walls, to its staff. According to Garner, the NOEH partnered with the city’s Office of Workforce Development to hire locally including bringing back former Methodist staff.